Imkan, an Abu Dhabi-based real estate developer with a portfolio of 26 projects spanning three continents, has launched the sales of its new tower at Pixel located within its iconic mixed-use project, Makers District, on Reem Island in Abu Dhabi. The sales, which kicked off yesterday (March 16) at Imkan's headquarters in Mina Zayed, witnessed an overwhelming response from investors and is set to conclude today. The project is scheduled for completion in Q2 of 2021. 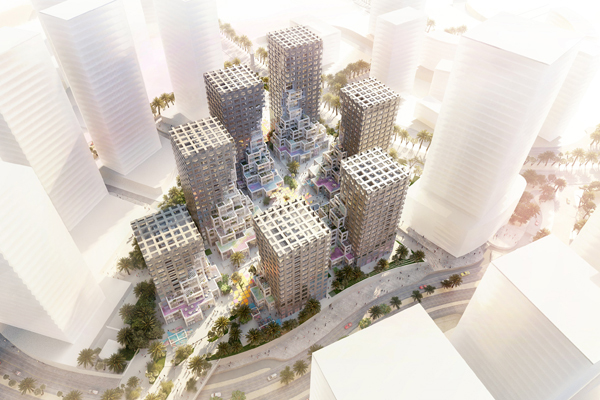 Pixel is MVRDV’s inaugural project in the UAE. The award-winning Dutch architects have been exhibited and published worldwide and are renowned for ground-breaking design such as Markthal in Rotterdam, Tianjin Binhai Library in China, The Stack in Melbourne, and RED7 in Moscow. The new project is promoting forward living in what is set to be Abu Dhabi’s new beating heart. The community will be made up of 525 residential units within seven mixed-use residential towers that are surrounded by quiet pocket gardens and frame a centralised pedestrianised plaza - home to an artisanal mix of food and beverage (F&B), retail spaces and offices, said a statement from the developer. Just 400 m walk from Al Reem Island’s first public beach within a community, and 300 m away from what will be the buzzing Waterfront Plaza, Pixel is designed to offer occupants a strong sense of community surrounded by an engaging and beautiful environment, it stated. CEO Walid El Hindi said: "Research is infused at every stage of our place-making process, and through the development of Makers District our research has shown that communities thrive where creativity can be expressed, nurtured and cultivated." "Pixel has been designed with this very notion at the forefront. We've honed in on the most valuable components: the public realm and the negative spaces between buildings to define the community. It is a key milestone in our journey to establish Makers District as an enriched and pulsating development in the capital," he added. The Pixel community will be located just steps away from The Artery, Imkan's unique hybrid parking garage and event space. The creative hub will portray world-class innovation through contemporary architecture and is geared to stimulate thought-provoking work within an ever-changing space. Makers District on Reem Island is a scenic waterfront community designed to cultivate creativity, and will be home to “Makers“- artists, entrepreneurs, curators, artisans, small and medium enterprises (SMEs) and those who appreciate the presence of a trendy environment that generates a vibrant pulse throughout the neighborhood.